As you've not doubt noticed, video has seen massive growth on social networks over the past few years. Facebook grew from one billion videos views per day to 8 billion within the space of fourteen months, Snapchat went from 4 billion to 10 billion in less than a year. Even on Instagram, where video hasn't been given as much focus, video consumption has gone up 150% in the last six months, while videos on Twitter have increased by more than 50% since the beginning of 2016. 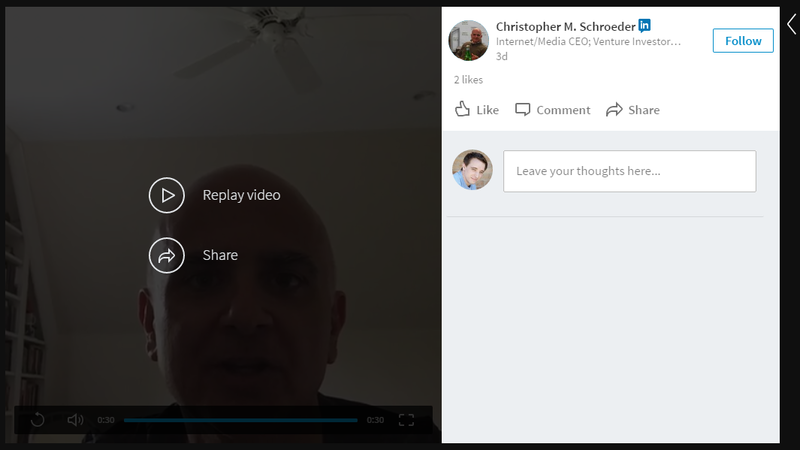 Given the focus on video from all the major players (Pinterest too is working on video pins), it comes as little surprise to see LinkedIn also move in-step, today announcing a new, native video option that will eventually enable users of the professional social network to better connect with prospective businesses partners and employers through the power of moving images. 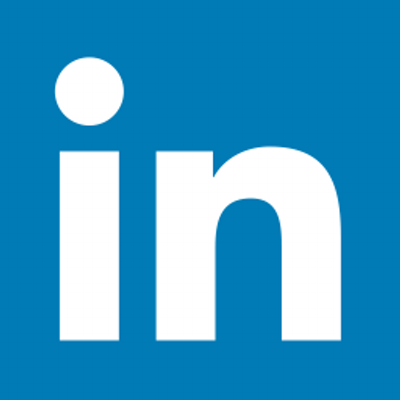 But as with all things LinkedIn, the evolution of the new offering will take some time. 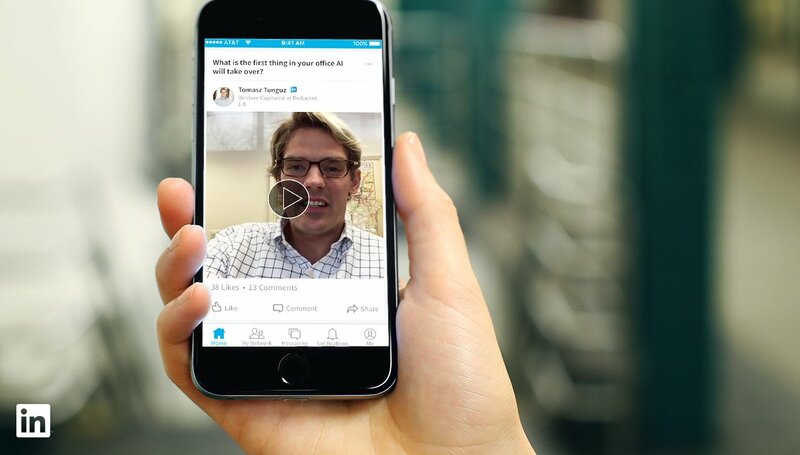 To begin their first foray into native video, LinkedIn's announced that users will soon start to see a range of videos posted by LinkedIn influencers in response to member questions - like this one from LinkedIn co-founder Reid Hoffman. "Today your LinkedIn Feed will come to life in a whole new way with the introduction of 30-second videos from LinkedIn Influencers. For the first time, we've invited more than 500 Influencers on LinkedIn to share their thoughts on trending professional topics and news, ranging from diversity and workplace culture, to education and innovation -- all through the richness of video." Those influencers will post their videos via a new, dedicated app called 'Record', which, as noted on iTunes, is currently only available to a limited number of LinkedIn members. As you can see, Record provides access to selection of questions to which users can choose to respond by creating a short video which they can then publish direct to LinkedIn. The app also enables users to track engagement and see how their followers are responding to their uploads. When an Influencer you follow posts a video, that video will appear directly in your feed. 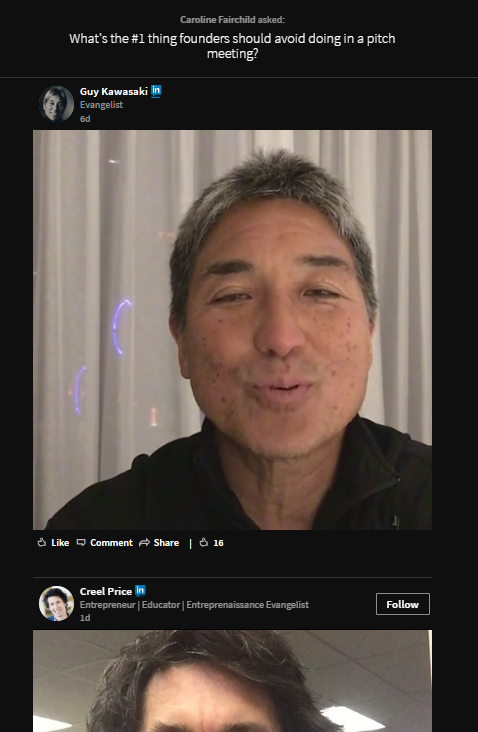 You can then play the video in-stream or click through to a dedicated viewer panel, which enables you to scroll through responses from other Influencers on the same topic. You can Like or share, and also add a comment or respond to comments from other members within each video post. LinkedIn's built their video player to be adaptive in order to play well on different devices and via different levels of network connectivity, so it should run smoothly for all users. It's a pretty logical move from LinkedIn, given the aforementioned stats on wider video usage. What's more, people are already posting a heap of video content on the platform - a growing number of people are uploading video links to their profiles to give prospective employers and business partners a better idea of who they are, like this example from Social Media Today contributor John Nemo. But those video links don't play natively, in-stream - once clicked, each opens a new player window in which the uploaded content can be played. This means LinkedIn is merely hosting the content for other platforms, but if they could introduce their own video option, that would provide a better user experience, a new way for users to showcase their personality and skills, while also providing LinkedIn a new potential revenue stream in the form of in-video ads. "...given that LinkedIn has a strong premium (paying) subscriber business, and is also working all the time to build out its advertising business, it seems like an obvious progression for both of these to come online at some point." Maybe LinkedIn will introduce videos as a Premium-only feature - they did the same for background images at first before eventually making them available to all users. LinkedIn says its video offering will follow a similar evolution to their Publisher platform, first opening up to influencers then eventually branching out to all users over time. As such, this new Q and A option is likely just a test to enable LinkedIn's development team to iron out all the bugs and prepare their systems for the next stage of a wider native video roll out. And really, as noted, it's a perfect fit - video is a great way to connect with audiences on a more human level, and providing users the ability to better showcase their professional selves on LinkedIn via video content will no doubt lead to more engagement and interaction with those profiles, putting them a cut above the rest of the pack. 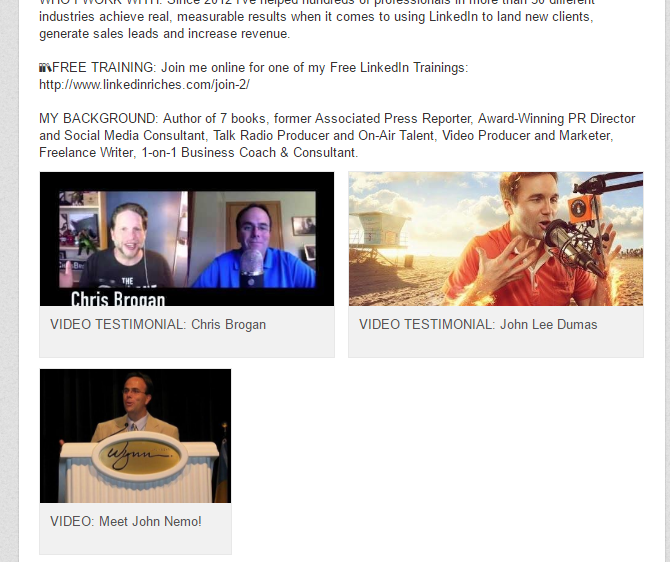 You'll start seeing LinkedIn's new videos appearing in your LinkedIn news feed from today.